The Practice Of “Forest Bathing”, Walking In Woodland Areas For Health Purposes, Originated In? Let’s be perfectly clear about something right from the start: the Japanese did not invent the idea of walking in the woods and getting some fresh air for good health. For centuries, people around the world (and long, long before the advent of modern medicine) have insisted that fresh air and exposure to nature is a good and healthy thing. What the Japanese did do, however, is actively focus on the idea of getting out of the city and into nature as a form of preventative care. 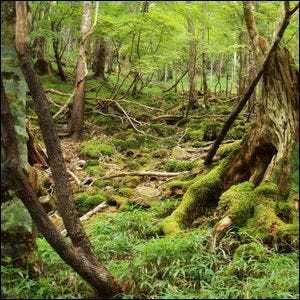 In the early 1980s, the Japanese Ministry of Agriculture, Forestry, and Fisheries began promoting the idea of “Shinrin-yoku”, a concept that can be literally translated as “forest bathing” or “taking in the forest atmosphere”. The premise was that urban life was stressful and that taking time to mindfully walk around a forest had distinct health benefits. By taking time to explore Japan’s forests, people could prevent health problems caused by high blood pressure, chronic stress, and other related issues. It turns out the Ministry officials were on to something and later research proved them right. When researchers had study participants walk in urban environments and forest environments under the same exertion conditions with the same instructions to be mindful and observe the world around them, it resulted in lower pulse rates, lower blood pressure, lower concentrations of cortisol, greater parasympathetic nerve activity, and lower sympathetic nerve activity in the study participants when they walked in a forest versus doing the same in urban or developed environments.